1. Start your day off right. Get up, have breakfast, take a shower, put on something other than pajamas, etc. – you get the idea. Remember, how you treat yourself on the outside reflects what you are thinking on the inside. Be good to yourself and it will show in your communications. Remember, when you work from home you only have your voice and tone, so everything you say and do will be scrutinized. 2. Create a dedicated work space with a door you can shut. You need a place where you do work that you can leave at the end of the day. To work from home successfully, you need to maintain a strong mental focus on what you do. You don’t want to have your work everywhere around your house, and you definitely want a door you can shut when needed. It’s also a good idea to conduct a home audit to assess those often overlooked projects that need to be done in your home or workspace. 3. Buy a headset with a good mute function. You want the headset so you can still have both hands-free while on the phone. A good mute function (i.e. it works, and others cannot tell when you switch mute on) will be an asset for you. It’s critical that your co-workers do not hear other noises in the background. That can disrupt important meetings and build resentment that you are at home. 4. Use a cordless phone. It’s hard to sit in the same spot in your house all day. Also, people who work from home generally work more (i.e. during times when others are commuting, etc. ), so you need to be able to get up, stretch, do some things around the house, etc. A cordless phone, including a headset with a good mute function, is key. 5. Use two monitors with your computer. There are studies and articles that show adding a second monitor will boost your productivity 20-30%. It’s totally true. A second monitor is critical to anyone who wants to work from home. 6. Leverage a web cam. One of the things you can do to regain physical presence in your communications is use a web cam. A web cam plus an instant messaging tool allow others to see you and for you to see them. This is critical in building rapport and communication with others. I highly recommend at least your team (if you manage one) and the person you report to have web cams. 7. Partner with your Team Leader (i.e. who you report to, some people use the term “boss”). The person you report to is a critical component in your work from home success. You should meet with this person once per week via phone to review what you have accomplished in the previous week, and what you plan to accomplish next week. It’s also critical that you make yourself available to this person whenever necessary. 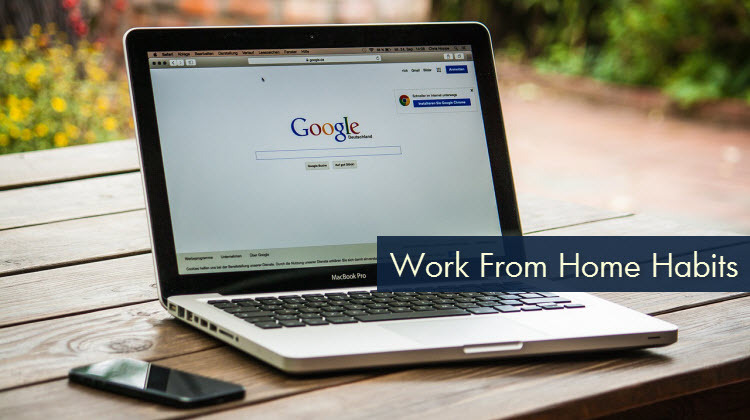 If they are going to trust you to work from home, you have to be transparent and accessible to them. 8. Develop key relationships with your team. You need eyes and ears in the office because you don’t have them. If you have effective work relationships with team members, work with them to support you while you are remote. Calling team members just to check in (i.e. without a specific need) is a helpful way to do this. 9. Master your phone system and conferencing tools. Phone conversations, conference calls, and voice mails are three critical tools in your work from home toolbox. All three of these tools allow you to inject tone into your communications, something that is lacking in email and IM. Each of these scenarios is an opportunity to create memorable communication experiences with the people you work with. Most phone systems have additional, rarely used features (like scheduling voice mails) that you can leverage to your advantage. Be sure to check the Dot Connector 10 Tips to Improve Your Voicemails for other ideas to help you. 10. Master your instant messaging (IM) program. IM is a useful tool for communicating with folks quickly and orchestrating events in the office. Need someone to jump into a conference room to join a meeting? Use IM to coordinate that. Knowing the full capabilities of your IM program can help you leverage it effectively. Be careful, however, not to use acronyms and abbreviated words too frequently. Not everyone will know what you are saying, and when you work from home, you need to be a clear communicator, not a confusing one. 11. Master your email program. Email will be a lifeblood of your work at home expereince. However, it’s important to remember that if you “match the medium to the message” (i.e. email is not appropriate for every message) in your communications, there will be times to use email and times not to use it. Check out the Dot Connector Email Management Series to get control of your email. 12. Leverage a screen sharing program. There are several tools that let you share your screen with people in the office, and vice-versa. This is a crucial technique for participating in meetings, as you can follow the presentation slides on your screen or present your slides just like you were in the room. These tools also help you train others on how to use other tools, websites, etc. and vice-versa. 13. Go back to the office regularly. It’s up to you to define how frequently you need to revisit the office. Some folks go back twice a year, some every quarter, and some even go back monthly. It all depends on your unique situation. However, it’s critical that you do have face-to-face time with people you work with. 14. Be memorable when you are in the office. Be animated in discussions and meetings, walk around the room in key meetings, and volunteer to give presentations to large groups. The key is to create experiences and situations where the people you work with will remember you when you are not there. Also, by doing this you create visuals in people’s minds that can augment your lack of presence in your communications when you work from home. 15. Go out to lunch. You need to leave the house. Going out to lunch is a great way to take a break, interact with other people, and refresh your mind for the afternoon. It is great to save money on lunch by eating at home, but forcing yourself to go out will help freshen your perspective. 16. Drive conversations. You have to tell your story, or someone will tell it for you. It’s critical that when you work from home, you make your point in discussions and meetings. People will forget that you are on the phone. They will talk over you and sometimes not hear what you say (especially if you are on speakerphone in a conference room full of people). Therefore, it’s critical that you are assertive in your speaking and focus on getting at least one major point/idea in each discussion. 17. Match the timezone of your co-workers and Clients. To make the transition to work from home easier, it’s important to match time timezone of your co-workers and Clients. For example, if they are primarily in the Eastern time zone, work and take breaks similar to business hours for Eastern time. 18. Stay organized. Staying organized is another key to successfully working from home. If you get too disorganized your productivity can drop exponentially, since you don’t have co-worker interactions to help change your attitude and boost your focus. Keeping accurate to-do lists and a strong mental focus can help you stay focused and organized. 19. Send hand-written cards to people. Not only is this a great thing to do in general, but for people who work from home it’s a critical tool. This is another way to make up for your lack of presence in the office and make yourself memorable to your co-workers and Clients. When you work from home, it can be easy to slip into “doing mode” and forget the intangible communication tools you would use if you were in the office: asking how people are doing before you “talk business,” saying thank you when someone does something for you, and reaching out to people just to see how they are. 20. Match your sense of urgency to your co-workers and Clients. It’s very easy to be “over urgent” when working from home. Issues sometimes seem bigger than they are. Sometimes it seems you are getting inundated with co-worker communications. Your workload can seem insurmountable. When you get these feelings, it’s time to get organized, re-prioritize your work, take a break, and have a discussion with someone in the office to get a sense of the “vibe” there.